Are you tired of looking at the worn out and baron area of landscaping around the trees in your yard? I know that I get a tinge of sadness every time that I look out into my yard to the disappointing view of my bare rooted tree or at the unruly weeds and grass that have taken over where the weed eater mercifully missed them. Either way, the view is not what I would call pleasant or happy. So what is holding me back from having beautiful landscaping around my trees? This question can be answered with one word; MONEY! Without the extra cash to afford such things as designer landscaping bricks or other pre-made landscaping elements, I turned my attention to the resources of the internet for some inexpensive do-it-yourself ideas. I found some incredibly interesting and unique tree landscaping ideas that nearly anyone can do for little to no money at all. As a matter of fact, there were so many great ideas that I had to share these creative tree landscaping ideas with you. 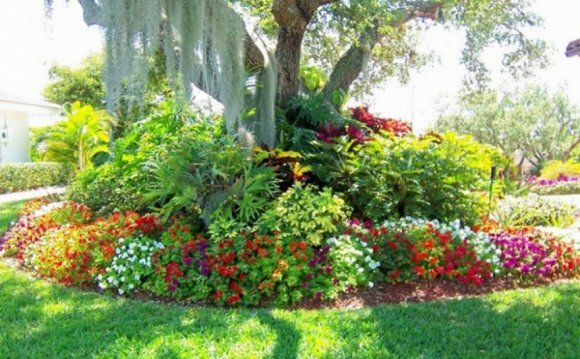 If you also are looking to “spruce” up the landscaping around the trees in your yard, check out these examples of outside-of-the-box solutions. Creating a beautiful space around the base of a tree can not only create a pleasant look, but it may also provide you and your family with an extra gathering area to sit and enjoy the pleasant outdoor weather. The cost of this type of landscaping solution can vary depending on from where you obtain the building materials. Lumberyards and do-it-yourself centers are great resources for purchasing brand new materials. For those who are in search of a cost-free solution, it is possible to use boards that are left over from other projects or are re-purposed if they are in good condition. These contemporary seat to ground benches create a cozy and inviting outdoor area that take care of disguising bare soil and weeding issues often associated with tree landscaping. Surrounding the base of the tree gives you the opportunity to enjoy your warm summer in the cool shade from any view.